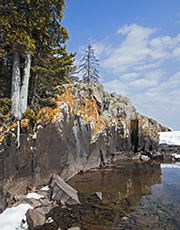 Once, a friend and I had the opportunity to photograph Lake Superior’s rugged shoreline on an unusually warm March day. While deep snow covered much of the ground in the Northwoods, the spring thaw had begun. Water cascaded over the broken chunks of ice as we passed a waterfall. Ahead the white lake ice broke into geometric shapes, revealing the Superior’s penetrating blue gaze, fanning out to the horizon. Overhead the sky shone a brilliant blue interspersed with the thin whisper of clouds. Hiking further, we saw mottled orange rocks resting on the lake bottom beneath the etched, transparent ice. Before us rose a jagged cliff scattered with pines and a stand of birch. Stretched across the rocky cliff was a brilliant intricate painting of dark orange lichen. Farther out from shore was a rock covered with delicate ice—the perfect ice cream scoop reflected in the shallow waters. What delight! Each way we turned, there was a spectacle in every direction. Where to set up our tripods? What to photograph first? 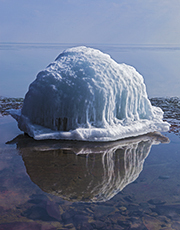 Lake Superior’s spring thaw provided a dazzling display and the natural world was our palette. Opportunities existed in every direction. A lesson to remember when the photography conditions are less than ideal.